The Pretalk is the most essential part of your hypnosis show and having a good one can increase your number of volunteers and even help to pre-hypnotize them for your show! The problem is most stage hypnotists are using a standard Pretalk that has no originality and just simply is not entertaining to the audience. If you are ready to take your pretalk up a notch and bring the entertainment value welcome to the right place. 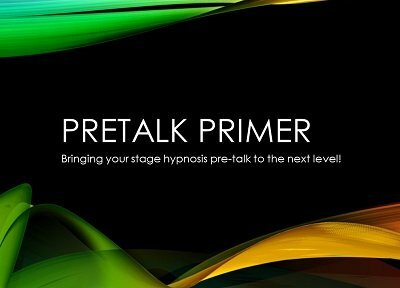 I know that most hypnotists are just using that standard one off pretalk but wouldn't it be awesome to have your own jokes, patter and customized pretalk that you can actually call your own? In this series I teach you the exact step by step formula I use to create and customize my pretalk to the audience to get them on my side and create rapport. YOU CAN USE THIS FORMULA TO CREATE YOUR OWN CUSTOM PRETALK! The simple fact is that when you have the tools you become a better stage hypnotist and entertainer and that is our job to entertain. Don't use some out of date pretalk from the Ninteen fifties. 1st edition 2014; PDF 15 pages; video length 1.5 hours.